My favourite hostel in Seville? 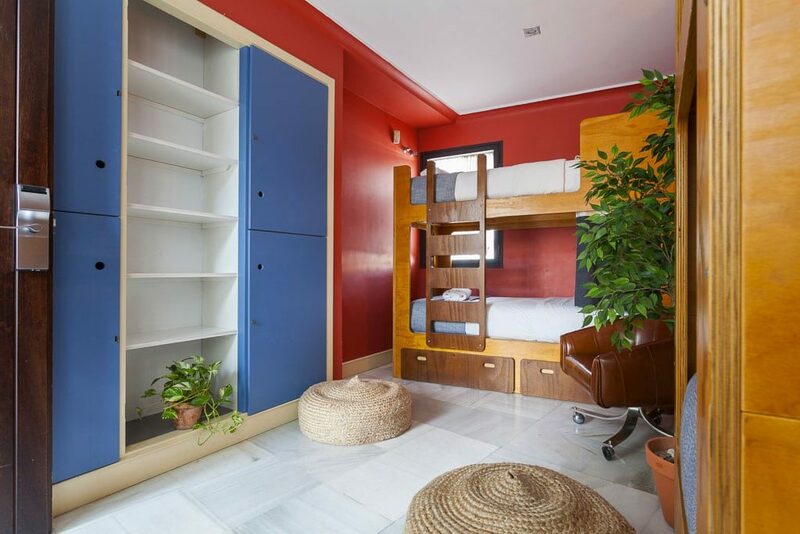 Welcome to La Banda Rooftop Hostel, Seville! Overlooking Seville cathedral, this hostel is all about the amazing rooftop terrace. Guests come together every evening to watch the sunset over the cathedral, enjoy musical performances from local artists and then tuck into their excellent daily dinners. 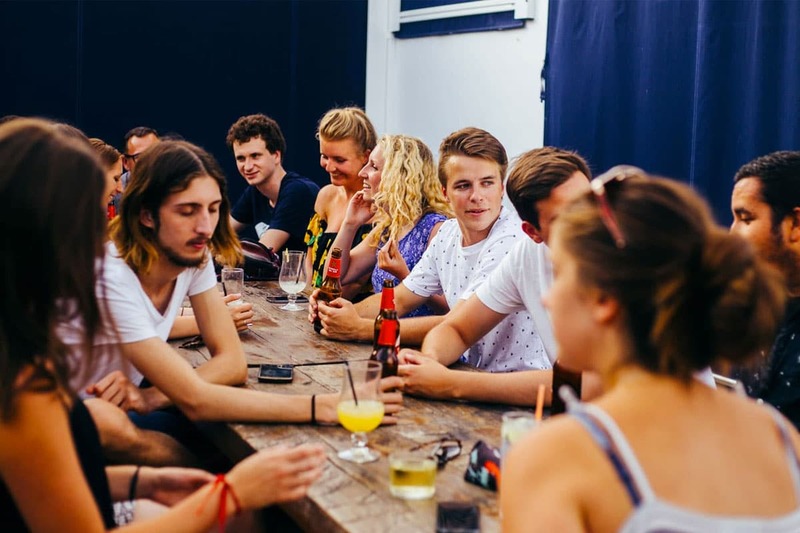 This hostel is all about socialising, meeting people from all over the world and having a great time. The hostel is a 2-minute walk from the tree-lined Canal de Alfonso XIII, 0.5 km from Seville Cathedral and 1.6 km from the Alcázar of Seville. Plus just around the corner from the hostel you have a clutch of historic tapas bars like the fantastic Casa Morales. Being a proper backpacker style hostel, the rooms here are dorms only. They have 7 mixed dorms ranging from 4 to 8 beds. If you’re looking for a superior dorm experience then definitely book a bed in one of their boutique dorms, which feature ensuite bathrooms and beautiful handmade wooden beds. All guests have a secure locker to store their stuff. Just remember to bring your own padlock. Plus also worth noting that all the rooms here have air-conditioning, which is important given how hot the summers are in Seville. If you are travelling with family or your partner, then I definitely recommend choosing one of their luxury apartments. The apartments are offsite and just a few hundred yards away. This option allows you to combine the luxury of having your apartment yet being able to take advantage of the social aspects of the hostel like the staff, the common lounge and also their amazing rooftop terrace dinners. The hostel is run by 2 brothers and their best mates. The guys all have a lot of passion for music, people and culture and this reflects in the hostel experience. For me you can tell the difference between a bad hostel and a good hostel by their musical tastes and playlists. Luckily for us all the staff here all have varied but excellent taste in music. Must have spent a few hours just chatting to the staff about bands and exchanging notes about must see music festivals. On the rooftop terrace where all the magic happens, the guys invite local bands to perform in the evenings. One of my abiding memories of my stay here was watching the sunset over the cathedral spires in the distance, while listening to flamenco inspired local band Caye Cayetana, whilst enjoying a scrumptious dinner of rice and chicken fajitas with other hostel guests. Their daily dinners cost around €5 and are worth every cent. Conversations with guests and the mojitos or the wine will continue well into the night. These kind of long (hazy) summer evenings, drinking on a beautiful rooftop terrace with people from all over the world and the amazing, surreal sight of the cathedral lit up at night: must rank as one of my favourite hostelling experiences. 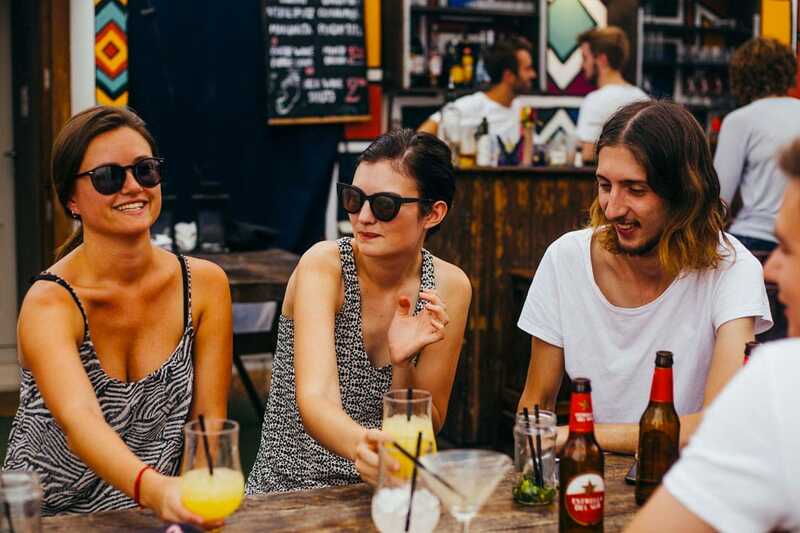 The hostel staff then take guests on a free tour of some of their favourite haunts: old man bars, ancient sherry bars and smoky local haunts that haven’t changed for years- this is not your run of the mill hostel pub crawl. The hostel also organises flamenco nights out- email in advance to check when this takes place. The staff here are amazing and besides their awesome musical tastes, have great tips to share on the best, authentic places to eat and also places to visit. Friends of the staff run an excellent free walking tour (tips are welcomed) of Seville’s historic sights during the day and also a late evening tour around the City’s Jewish Quarter. Other cool things to mention: they offer a free, generous complimentary breakfast in their downstairs lounge-choice of cereals, breads, jams, nutella, peanut butter (yeah!) plus juices, tea and coffee. They also have an excellent communal kitchen. However, given how amazing (and cheap) the food is in Seville, plus the great dinners here, I didn’t spend any time here. La Banda is one of those hostels that lives on in you, long after you have departed. 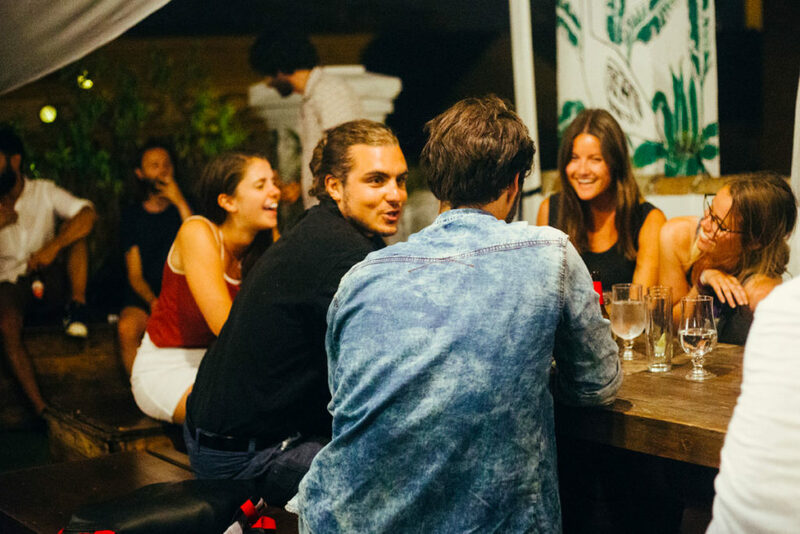 With their focus on atmosphere, socialising and good times, the La Banda team have created one of Europe’s most memorable hostels. Wherever you plan to visit in Europe, do not miss out on this hostel and Seville. 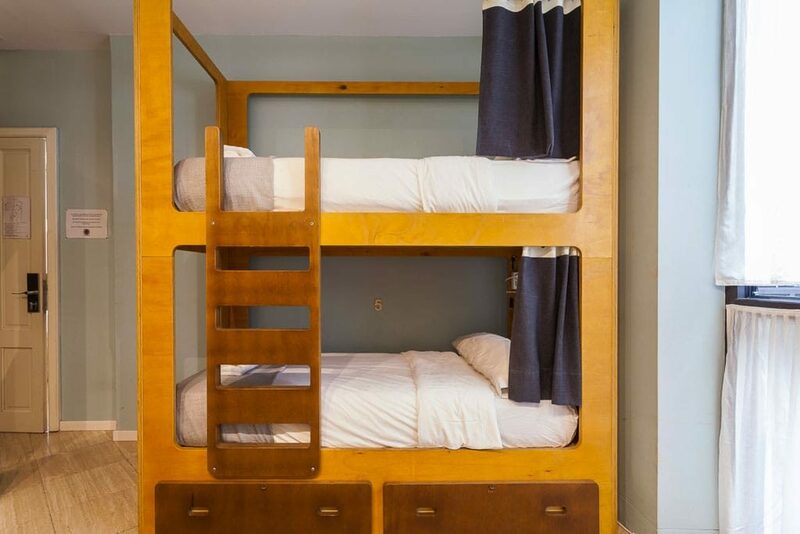 Booking via Hostelworld, a bed in a 8-bed ensuite dorm starts around €27 while a bed in their 4 bed mixed dorm is around €33. Address: Calle Dos de Mayo 16, Seville, Spain. A hostel with an outdoor swimming pool in Barcelona? Disasters or Dreams: How Does the Size of Your Team Affect Remote Work?